Magpie Quilts: Leftover fabric plus stash fabric equals stunning quilt! 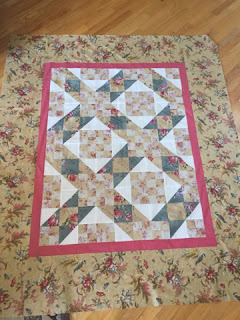 Leftover fabric plus stash fabric equals stunning quilt! Do you remember this quilt top from last year? It's back from being quilted by Marie at Blueberry Hill Quilts. And I love how it looks! The quilting always adds the extra little bit of texture. The centre is just an arrangement of 4-patch squares along with some 1/2 square triangles. The rose pink inner border was bought after the centre was pieced and the outside border fabric was pulled from my stash collection of fabrics. The final binding was chosen after the quilt came back from quilting. I had a green set aside, but it just didn't look right when all was said and done. A brown shade pulled from the border floral ended up as the binding around the outer edges. The backing fabric is a plain muslin. It's a little stiff right now as I don't pre-wash any of my fabrics. It will soften and pucker up slightly after it's first wash and will be a cozy quilt that will last for years! Do you have fabrics left from another project? Not sure if you have enough to make something? Try a few 4-patches and 1/2 square triangles and rearrange until you like them! Add coordinating fabrics from your stash! No pattern required!